JERUSALEM — Palestinian militants in Gaza mounted an intense and sustained rocket and mortar attack across much of southern Israel on Monday in retaliation for the killing of seven fighters by Israeli forces in a botched covert operation in Gaza the night before. Israeli aircraft and tanks struck back repeatedly, hitting military targets in Gaza but also leveling a television station and attacking the homes of several militants, in the territory’s heaviest fighting since a war with Israel in 2014. The fighting threatened to scuttle months of multilateral talks aimed at calming the Israel-Gaza border, where protests since March have been met with a lethal Israeli response, killing some 170 unarmed Palestinians and wounding thousands more. The talks had already produced concrete steps to ease tensions in Gaza, including increased electrical power and the influx of millions of dollars in aid. More than 300 rockets and mortar shells were fired into Israel on Monday, scores of them intercepted by Israel’s Iron Dome defense system, the Israeli military said. By nightfall, the military said its fighter jets, attack helicopters and tanks had struck more than 70 military targets in Gaza belonging to the militant groups Hamas and Palestinian Islamic Jihad. The authorities in Gaza said three Palestinians had been killed in the Israeli airstrikes and three others were wounded. 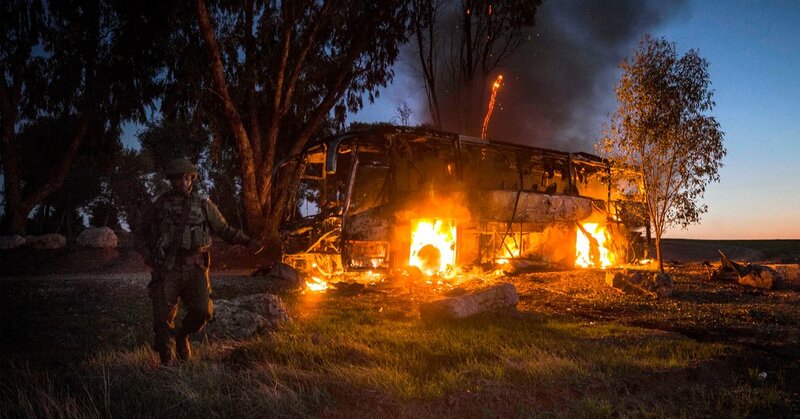 More than a dozen Israelis were reported wounded in the rocket and mortar attacks, including a soldier, 19, who was seriously injured when a bus was struck near Kfar Aza, northeast of Gaza, by an anti-tank missile. The Israeli military ordered all residents in the south, including in the cities of Ashdod and Beersheba, to remain in bomb shelters. There were reports homes had been struck and residents injured in Netivot and Sderot, Israeli towns near northern Gaza. Air-raid sirens were heard as far away as Hebron and the Dead Sea area. On Monday night, both sides were escalating the conflict. Just before 9 p.m., armed factions in Gaza said they were ratcheting up their rocket attacks, and sirens began sounding every few minutes near the Gaza perimeter. A direct hit was reported on a building in Ashkelon, Israel. In Gaza City, employees of the Hamas television station Al Aqsa received a telephoned warning to evacuate its offices there on Monday night. The building was soon leveled by multiple missile blasts that were captured on video by onlookers. The Israeli military said the station, which was “owned and operated” by Hamas, was a legitimate military target. “It contributes to Hamas’ military actions, including by providing operational messaging to militants, directing and explicitly calling for terror activities against Israel, and providing guidance on how to carry out such terror activities,” the military said in a statement. Soon after, an Israeli airstrike demolished Al Aqsa’s radio station. Six Hamas fighters, including a commander of forces in the Khan Younis area, and a member of the Popular Resistance Committees, another armed faction, were killed. An Israeli lieutenant colonel in the elite Maglan unit, a commando brigade, was also killed in the clash and was hailed as a national hero at his funeral on Monday. According to a former Israeli official with knowledge of the operation, the mission’s goal was surveillance, not an assassination. Israeli intelligence officers frequently conduct this kind of operation, which is usually aimed at installing surveillance equipment. Because of extensive planning, they are considered at a low risk of exposure and confrontation. Still, he said that the covert operation on Sunday had not been a deliberate provocation but was a routine part of the Israeli military’s efforts to contend with terrorist threats across its borders. That the mission was botched has already produced military and diplomatic consequences. In addition to the heavy bombing on both sides on Monday, it could derail cease-fire talks mediated by Egypt that had appeared to show progress in recent days. With both sides eager to address Gaza’s collapsing economy, electrical shortages and a deepening humanitarian crisis, the talks had already yielded measures to ease life for Gazans. Israel agreed to let new shipments of diesel fuel be delivered to Gaza’s power plant, sharply increasing the availability of electrical power for residents of the beleaguered coastal enclave and allowing sewage treatment plants to resume operation. Last week, Israel allowed a donation of $ 15 million in cash from Qatar to be driven into Gaza, where Hamas distributed it as back pay to thousands of its civil servants who have received only a fraction of their salaries for months. That was hours before the Israeli commando team had its cover blown in Khan Younis, setting off a firefight and requiring airstrikes to cover its retreat into Israel. Hamas, the group that governs Gaza, was collaborating on the strikes against Israel with rival factions including Palestinian Islamic Jihad, the Popular Resistance Committees and several other armed groups, according to a joint statement. In a sign of its respect for the Palestinian rockets’ range, Israel began opening bomb shelters as far as 25 miles from the Gaza border. In Kibbutz Alumim, less than two miles from the Gaza border, Sara Mash, 32, a secretary, said her three children and husband had been in their safe room — their children’s bedroom — since 4:30 p.m., when they first heard an explosion and then an air-raid siren.